KIEV, Ukraine -- The punches traded in Ukraine's parliament Tuesday show the country remains far from politically stable and a deal to prolong the stay of the Russian Black Sea Fleet has only exacerbated divisions. Analysts said the decision by President Viktor Yanukovych to sign an agreement allowing the fleet to remain in Ukraine until at least 2042 has sharply polarized national opinion to a worrying degree. "Yanukovych's political stability ended the day when he signed the accord on the fleet," said Igor Zhdanov, president of the Open Policy center in Kiev. "This is only a beginning, but this beginning could end in a serious political cataclysm. A step in this direction has already been made," the analyst said. 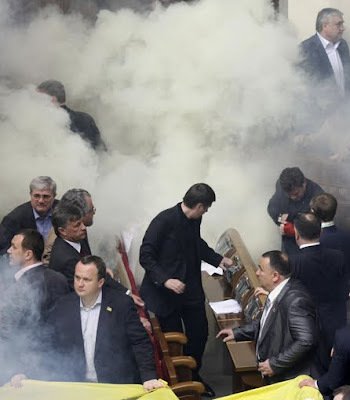 As the parliament - the Verkhovna Rada - filled with fog from smoke bombs hurled by opposition lawmakers, thousands of their supporters demonstrated outside, and charismatic ex-prime minister Yulia Tymoshenko vowed to hold a new rally on May 11. "The events of today have shown that there is a division both within the political class and society about the fleet," said Volodymyr Fesenko, director of the Penta center for political research. "I think there are going to be further outbursts." The election victory of the pro-Russian Yanukovych in February had raised hopes even amongst his sharpest Western critics that Ukraine was set for much needed stability amid a severe economic crisis. Unlike his predecessor, the pro-Western Viktor Yushchenko who finished his term a lonely figure after falling out with former allies, Yanukovych enjoys the support of all the main branches of power. Prime Minister Mykola Azarov is his loyal acolyte and his supporters have a majority in parliament. In the election, he had reached beyond his Russian-speaking strongholds in the east of the country, and made overtures to the Ukrainian-speaking west regions. But regional parliaments in western Ukraine have now called for the president to be impeached and the division with the east seems as strong as ever. Yanukovych's deputy chief of staff Ganna German admitted to reporters in unusually candid comments ahead of the ratification that the government was well aware the accord with Russia would be taken badly in a large part of the country. "If another option existed it is possible that this decision would never have been taken. But our economy has put us in a complete impasse," she said. "From two evils, you chose the lesser. Of course for many in the country it was a heavy blow. But losing everything would have been an even heavier blow." Under the deal, Russia has agreed to give Ukraine a 30 percent discount on Russian natural gas imports estimated to be worth 40 billion dollars over 10 years. But while the situation remains tense in Ukraine, analysts cautioned there is not yet sign of any repeat of the 2004 Orange Revolution when a popular uprising swept the established pro-Kremlin order from power. "We are still far from a new revolution," said Fesenko. "I have the impression the opposition did not believe too much in the success of its initiative (in parliament) and the objective was more to attract media attention." Zhdanov said the future outcome will depend on the actions of the government and the opposition, especially if the authorities use tough tactics against protesters. "If the authorities try and stop the protests then that will encourage them," he said. The image of Tymoshenko, microphone in hand, next to fellow opposition politician Arseniy Yatseniuk as she addressed the crowd outside parliament, may have brought back memories of the opposition unity in the Orange uprising. But analysts in Moscow, where the authorities have been toasting the deal which will bind the ex-Soviet neighbours closer for decades, doubted whether the Ukrainian opposition has the strength to launch any sustained challenge. "Tymoshenko has rallied all the forces that she could," said Kirill Frolov of the CIS Institute. "It was the maximum. They cannot prevent the course of history, which is leading towards a restoration of the closest relations between Russia and Ukraine." The "oposition" AKA PRO-WESTERN" cronies have not learned the lesson of their master when it comes to "noise" (protests) in an artificial political conflict: It is the economy "STUPID"! The sour Orange leaders had their chance to shape the future of Ukraine, but the country, during the last five years, was inmersed in corruption and money dealings of powerbrokers... yes, the Orange powerbrokers. What are they crying about? Sevastopol port is Ukrainian property. Yushencko's pain is not having a NATO base in Sevastopol after 2017; and Tymoshenko is creating a smoking screen that she does not even believe herself. Her acting has low qualifications, and they will deepen as soon as the back-room deals that she made as PM start coming up to the public eye.